The plastic drinking bottle for the bike still is the most widely spread variant, most of the times, it is transparent. For example, the model Big Mouth from Specialized is very popular and a classic. These bottles are mostly available with an ad imprint from stylish bike brands or as team bottles. The largest advantage of the drinking bottle of plastic: It is unbreakable and light. But with time, it can take on strange tastes, it is not tasteless. When deciding on which one to buy, you absolutely must pay attention to the information whether the drinking bottle is BPA-free in order for it to be harmless to your health! It should be unpolluted, food-safe, leakproof and drip-proof. Some bike bottles are also extra marked as dishwasher-safe. Furthermore, there are drinking bottles with thermo function which keep the beverages pretty cool or warm for a long time. Bike bottles of stainless steel (rustproof) and of aluminium. Stainless steel drinking bottles are completely harmless as to harmful substances. They can have bumps and are nearly indestructible and long-lasting. Although the stainless steel variant has a higher weight. Aluminium drinking bottles also are less harmless to the health than the ones of plastic (which contain plasticisers), but they are susceptible to bumps, and as soon as the paint comes off, it should be replaced. Camelbak in fact even provides glass bottles for bikes for the a sporty application, they are protected by a coating of silicone. You can also find clever bottles with an integrated filter system. It is your choice, different shapes, different sealing caps as well as valves and mouth pieces... It is completely up to your personal preferences which type of drinking bottle you dedide to buy for your bike. Should the question come up whether you can fasten the drinking bottle to the bike, the solution is the fitting drinking bottle holder for the frame or the fastening behind the saddle! Normally you do not need to be concerned about whether the new drinking bottle also fits into the existing bottle holder. The bottles are usually shaped similarly and each common bottle holder can hold them. Do you place emphasis on an especially light carbon bottle holder (e.g. from AX Lightness or Tune) or do you want one with a side access? Those are practical for frames with not much space in the frame triangle! For the particularly streamlined racers, Elite for example offers a special bottle kit, drinking bottle with holder in aerodynamic shape, in a set. Under Accessories for bike bottles you'll find replacement caps, mouth pieces, replacement filters and more small parts for the bike bottle. 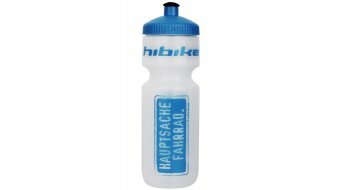 Everything at favourable prices online here in the shop for drinking bottles for bikes.